Did you manage to solve the puzzle in the last post? Did you have to change your thinking to solve it? If you did not manage to solve it and you now look at the solution presented above, can you discover something in your thinking that stopped you? Did you find an entirely different solution? Most people in Australia, New Zealand, North America and Europe drink cow’s milk, some in large quantities and many from an early age. What Prof Woodford writes about in this book should therefore be of concern to hundreds of millions of people. It is a story of research, business, government and vested interests. 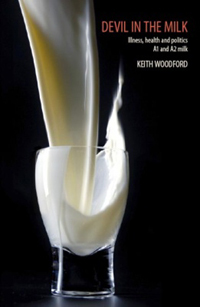 Those whose interests seem to be least considered in the way milk is presented to us are the consumers of the milk. Is the education we offer our young people equipping them for a fulfilling life? There is too much knowledge available to impart it all. How do those who set the curriculum choose what should be taught? The pool of knowledge is growing exponentially; however, the pool of useful questions is much more manageable. There are some very worrying indications that most people have given up thinking. Andy Bilchbaum and Mike Bonanno, who some years ago made up ‘the Yes Men’1, gave addresses to august bodies, including the WTO (World Trade Organisation). In their presentations they made outrageous suggestions and claims, and those in the audience responded with nodding heads and even acclaim. No-one in the audience was thinking – no-one asked questions or challenged the impersonators. In my blogging, my essays and much of my other writing I urge the reader to think. Thinking can be scary, as can answers we come up with. What is the use of thinking, anyway? Haven’t all the important questions been asked? Haven’t most of them been answered? How can we come up with anything new or important? 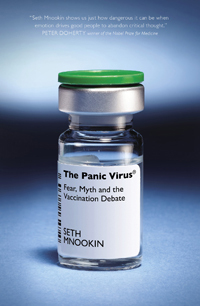 When we are dealing with large issues that have a huge impact on society and the lives of the individuals in that society, it is important that we have available to us books such as The Panic Virus, to assist us in navigating our way. Vaccination is a global phenomenon with almost global support from governments and the medical professions, from academics and the World Health Organisation. It also has its many opponents and detractors. There are powerful and emotional arguments on both sides of the debate. It is easy to imagine that we are self-sufficient in our adult lives, making our choices independently of others and believing that we don’t need anyone else for our survival. However, very few people actually are self-sufficient.